Lycaon pictus, the African Wild dog. An endangered species, Lycaon pictus is a canid found only in Africa, especially in savannas and lightly wooded areas. 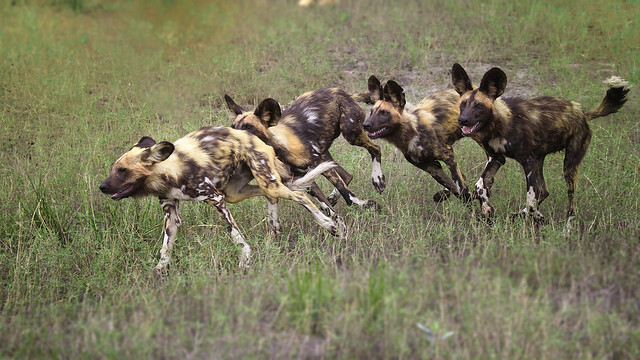 It is variously called the African wild dog, African hunting dog, Cape hunting dog, African painted dog, painted wolf, painted hunting dog, spotted dog, or ornate wolf. I had an excellent opportunity to see these magnificent creatures for a long time when we were in Botswana. Spending almost 4 hours with the pack as they went about their business. I got a whole lot of photos but this particular one of young adults galavanting around after a meal has a dynamic quality which i particularly loved. Unfortunately the species in under a threat due to various reasons. Continue reading Lycaon pictus, the African Wild dog. Posted on July 29, 2014 August 1, 2014 Categories Mundane MusingsTags african wild dog, botswana, lycaon pictus, photography16 Comments on Lycaon pictus, the African Wild dog. It is a very slow process taking years. No it is not so! It is not so specially if you go to a REBT practitioner. REBT (pronounced R.E.B.T not rebbit) stands for Rational Emotive Behavioural Therapy. Created and Developed by Albert Ellis, REBT does not focus much on your past events but more on your present state of emotions and disturbances. It has a very easy to understand model for psychological and emotional disturbances which is very aptly called the ABC of REBT. I first came across this model when I consulted Dr. Shishir Palsapure of MorphicMinds a couple of years ago for what I feared was a Major Clinical Depression (It was not. I was merely upset.) I was so blown away by the directness and effectiveness of the method that I started to study REBT as an interest to better understand how human cognition works and now I can apply its principles in almost everything I do. So what is the ABC model?